Should we teach other religions in Anglican Schools? I was reading the Qu’ran aloud with a class of senior students who had elected to take the Religious Studies course (ACT Board of Senior School Studies Tertiary level). Suddenly one girl burst out: “This is what I hate about religions, how God is so horrible and judgemental.” I looked at her with interest. “But Jenny, that is not what God is like in the Christian Bible – what about the story of the prodigal son?” She looked at me blankly. She didn’t know the story. So I told it to the class. They listened transfixed. The old story, so new to many of them, now had a whole new layer of meaning. It was a magic teaching moment. This true anecdote provides one explanation of the opportunity provided by the study of other religions in Religious Education classes. It is one reason why I would advocate that the subject be called RE rather than Biblical Studies or Christian Living. However to recommend that precious Religious Instruction time be spent on non-Christian religions is controversial. Some chaplains would feel it is a betrayal of the Christian faith and a capitulation to relativism. Others embrace the idea, rejecting any whiff of indoctrination in favour of a neutral educative curriculum which at least exposes students to the pervasive spirituality of humanity. Often this approach goes with an emphasis on chapel and worship as the arenas for Christian spirituality. society on whose behalf schools educate. Factors such as developmental level, pedagogy and children’s background also need consideration. If we take the first key area, the Christian identity of an Anglican school, it is not appropriate that teaching of other religions undermine or neutralise the Christian foundation of the school by for instance, engaging in non-Christian religious practices. Other religions should be described not advocated. Moreover Christian love and respect for all people, even those who hold beliefs with which we may disagree, should characterise our teaching. In terms of the second key area, the society in which our schools operate, we must not promote disharmony and prejudice but are responsible to encourage reasoned thinking and knowledge that facilitates shared democratic values. Putting these concepts together means that teachers should be honest about their Christian starting point, explaining that we are looking at these faiths because they mean a lot to many people, but that they are different to Christianity. The educational philosophy which approaches all knowledge, including that of other faiths, from a Christian assumptive basis, but at the same time operates with openness and academic freedom is known as ‘critical confessionalism’. It is based on the idea that, while we recognise explicitly the influence of our pre-existing beliefs we aim to critique all knowledge. The intersection of belief and critique enables growth in knowledge and understanding. Studebaker describes the markers of critical confessional methodology as comprehensive (not shirking any uncomfortable but relevant material), comparative, scholarly (committed to truth) and self-analytical (willing to interrogate our Christian assumptions evidentially). Such an approach is very much in harmony with the Anglican ethos of inclusiveness and intellectual rigour. There are at least four different justifications which can be given for including appropriate teaching of non-Christian faiths. The most important is the spiritual benefit to the student. Teaching about other faiths in a comparative manner gives a much clearer understanding of the Christian faith, as in the anecdote which commenced this paper. It throws into sharp relief exactly what Christians believe and, if taught accurately, educates not only about what is in common in religious life, but also what quite different epistemologies and motivations may underlie similar actions. Such teaching also emphasises the universal nature of religious belief and thus provides a check to the dominant anti-spiritual, atheist worldview. We cannot force students to become Christians. Respectful teaching of different views models an educative openness which in turn neutralises students’ perception of bias and opens them to the work of the Holy Spirit. 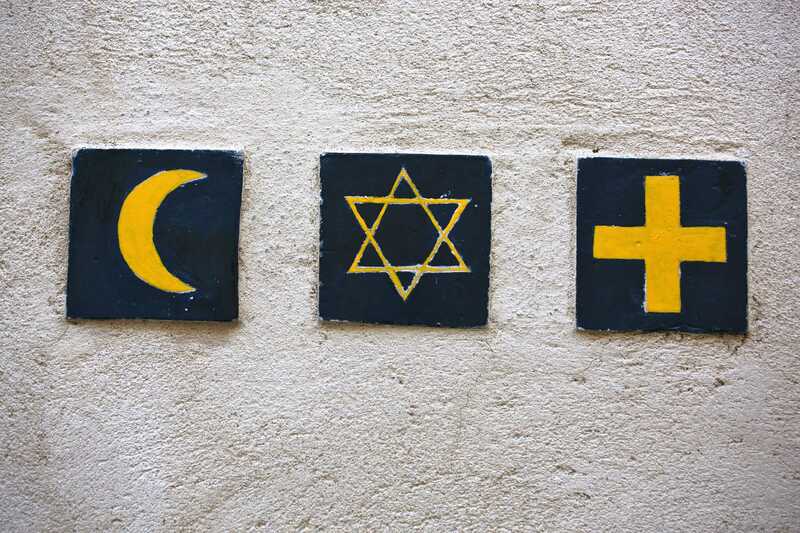 Understanding of other faiths in our contemporary multi-faith community equips Christian young people to connect with adherents. If we understand something of what Muslims, Hindus or Buddhists believe, and can use their religious terminology, we are much more likely to engage in meaningful dialogue and be understood when seeking to explain what Christians believe. After teaching Hinduism I found myself sitting next to a Hindu parent at a school function for my son. When he asked questions I understood where he was coming from and knew the distinctive aspects of Christianity to point out as we conversed. John Stott called this “double listening” (Stott, 1992, p110) – understanding both our context and also Christian truth, in order to translate the latter for the former. We live in a heterogeneous, multi-cultural society where dangerous clashes between belief systems lie just below the surface. If our students are to promote a harmonious society, and “love their neighbours as themselves”, they cannot afford to be ignorant and prejudiced about the belief systems which motivate others. Understanding breaks down barriers, facilitates recognition of common humanity and informs policy with realism. The post-modern world has turned out to be much more religious than the early secularists anticipated, and having religious understanding is becoming essential in dealing with global fears and conflicts, especially current radical Islam. International policies which patronizingly assume secular materialism as the norm, ignoring religious meaning, are often doomed to failure. We have a social obligation for students to acquire the knowledge and concepts which will enable them to contribute to a just democratic society. The essence of education is the pursuit of truth. To ignore whole branches of human knowledge and behaviour is to deprive students of essential knowledge. Learning to think critically in religious frameworks is an intellectual discipline which has as much intrinsic worth as pure mathematics, and more immediately apprehended relevance to daily life. By learning about religious beliefs, practices and assumptions, students learn to interrogate assumptions and critique interpretations. They learn to analyse and to think, to set aside prejudices and understand deep wells of human experience. A superficial and dogmatic presentation of Christianity does not achieve this educative function. While learning other faiths is certainly not the only antidote to indoctrination it is a salient way of bringing us back to our core role as educators. By definition schools are for education, they are not essentially for faith propagation. To fulfil our obligation to the families which place students in denominational schools, we need to educate the students well about all of life, and that includes other religions. Good religious education in an Anglican school will grapple with religious plurality from within a Christian philosophy, which believes in the reality of God, the importance of truth, the need for redemption and the centrality of sacrificial love. By teaching in a way honouring to Christ, modelling Christian behaviour and explaining Christian beliefs either directly or through comparison with other belief systems, we certainly hope that young people will decide to follow Christ. But ultimately that is not up to the school: it is the role of the Holy Spirit to convert them, and the explicit central purpose of the church to nurture them. Cooling, Trevor (2014). ‘The Diversity of school culture’. In K Goodlet and J Collier (eds. ), Teaching Well: A guide for Christian educators. Canberra, Australia: Barton Books. Smart, Simon (2004). Spectator’s Guide to World Religions: An introduction to the big five. Australia: Blue Bottle Books. Stott, John (1992). The Contemporary Christian. Inter-Varsity Press. Studebaker, Steven M. (2013). ‘From doctoral program to classroom’. In Stanley E. Porter (ed. ), Those Who Can, Teach: Teaching as Christian Vocation. McMaster Divinity College Press, Pickwick Publications. You also need to read the Qu’ran, the Bhagavad Gita, the Tipitaka or extracts and give some active thinking to how these compare with a Christian worldview. Ruth Edwards is the author of ‘Challenge and Choice: Australian Anglican schools today’ which is the definitive exploration of the typical culture of Anglican schools in Australia, based on doctoral research. She has wide experience teaching across subject disciplines in all school sectors, and has run a Religious Education Department in an Anglican school. She has also worked as an educational researcher and school marketer. Her current interest is in writing and in encouraging Anglican schools to be genuinely educational and genuinely Christian through being authentically Anglican.